ABOVE: Inside a modern train on Linea A.
Linea A runs from Battistini, on the western edge of the city, to Anagnina in the southeast. (The latter is close to Ciampino Airport, with a shuttle bus serving airline passengers.) The line is popular with tourists, because it has stations at Spagna (close to the Spanish Steps), Barberini (near the Via Veneto and the Trevi Fountain), and the Piazza Del Repubblica. Linea B goes from Rebibbia, on Rome's northeastern edge, to the modern districts of EUR and Laurentina in the south. For tourists, the most important stations (besides Termini) are likely to be Colosseo (for the Colosseum), Circo Massimo (Circus Maximus), and Tiburtina (the location of Rome's main intercity bus station). Line C, the newest of the three, is an offshoot of Linea A that extends to the southeast. It's mostly of interest to locals. Of the two original lines (A and B), Linea A is the more comfortable, with modern open-plan trains like the one in the photo above. 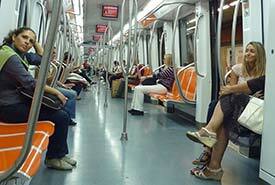 Linea B's trains aren't air-conditioned and can be stuffy in summer. Still, both lines are functional and convenient, and unless you're traveling at an odd time on a Sunday or holiday, you won't need to wait more than a few minutes for a train. The Metropolitana is open from 5:30 a.m. until 11:30 p.m. on every day except Saturday, when trains run until 12:30 a.m.
Before you can ride the Metro, you'll need to buy a ticket (see our Metrebus tickets and fares article for details) or the Roma Pass, which is a transportation and museum card for tourists. Insert your Metrebus paper ticket in the slot on the front of the turnstile, as shown in the diagram next to the slot. Be sure to retrieve your validated ticket when it's ejected from another slot on top of the turnstile. If you're using the Roma Pass or another RFID (radio frequency identification) ticket, simply hold the pass or ticket against the round yellow sensor on the front of the turnstile. The turnstile gates will open when your ticket or pass is recognized, and you'll need to keep the ticket or pass with you while traveling on the Metro. Note: Transfers between Lines A and B are free at Termini Station, as long as you don't exit through the turnstiles. On the platform, you'll see an electronic sign that tells how soon the next train will arrive. You'll also see a warning to stay behind the yellow line at the edge of the platform. When the train comes, wait for the doors to open and stand aside to let passengers exit the car. If no one is getting off, press the button by the doors to open them. For more information and trip-planning tools, visit the Web site of Rome's public-transportation agency, ATAC.